Cape Hopewell is home to a variety of unique geological formations. Large boulders dot the shoreline, often found in sea stacks and other odd formations -- sheer drops and raised beaches are the norm. As any other along the Bay of Fundy, this area boasts an extremely varied tide. Hopewell Cape in particular, however, boasts some of the highest average tidal ranges in the world; the high tide can rise as much as 16 metres (52 ft). During low tide, there is plenty of beach and numerous tidal pools; however, during the high tide, the water comes to the cliff's edge. The Bay of Fundy is a large bay of the Atlantic Ocean and part of the Gulf of Maine, separating Nova Scotia from New Brunswick. The bay has a tremendous effect on both provinces coastlines and climates. The upper part of the bay splits into Chignecto Bay in the northeast and the Minas Basin in the east, past Cape Split the Whisper Beach area. The Bay of Fundy has an extreme range of tide; the highest tidal surge ever recorded occurred in the Minas Basin, a northeastern part of the bay. The water level rose 21.6 metres (70.9 feet). The tides in the Bay of Fundy are semidiurnal (tides that have two highs and two lows each day). The height that the water rises and falls to each day during these tides are approximately equal. There are approximately six hours and thirteen minutes between each high and low tide. See the tides rise in GIF format (warning: large file). Much of the coastline of the bay varies with the tide. Muddy and marshy mudflats contrast against sharply-rising coastal cliffs by low tide. However, the land becomes starkly different during the high tide: the headlands and cliffs disappear, and the water rushes right up to the land. One of the bay's unique features occurs in rivers that drain into the bay. Tidal bores are common with each change of the tide; tidal bores are "a tidal phenomenon in which the leading edge of the incoming tide forms a wave (or waves) of water that travel up a river or narrow bay against the direction of the river or bay's current." 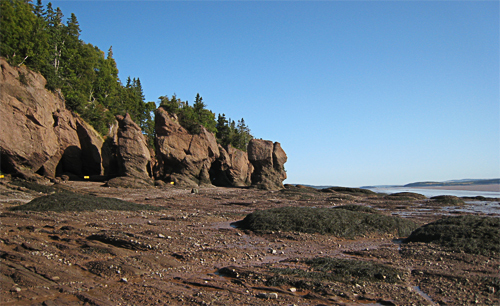 Additionally, the Bay of Fundy is home to an interesting geologic feature, the Cape Hopewell rock formations, near Saint John. Lastly, much of the water in the Bay of Fundy -- especially within the Minas Basin and Chignecto Bay -- is brown due to large amounts of suspended silt.